Designed to add an essential spark to your weight management efforts, this synergistic formula combines the effectiveness of gymnema and chromium with additional ingredients to help balance blood sugar levels, increase energy and promote healthy weight management. Chromium is a compound which is chiefly responsible for activating insulin, the balance of which is key in controlling body fat. Gymnema sylvestre is an herb native to the tropical forests of India, whose name literally means "sugar destroyer." Gymnema helps reduce unhealthy cravings that often result in overeating and weight gain. Combining Shape-Fast® Ultra with Catalyst Plus will give you the one-two (thermogenesis and appetite control) punch to support a healthy weight. Gymnema sylvestre, or gurmar, is an herb native to the tropical forests of India, whose name literally means “sugar destroyer.” In addition to “destroying” the taste of sugar, which helps to neutralize cravings for sweets, Gymnema supports the effectiveness of insulin within in the body. Gymnema helps reduce unhealthy cravings that often result in overeating and weight gain. Chromium is an essential trace mineral shown to help support healthy blood sugar levels, increase energy, and aid in healthy weight management. Key ingredients such as lagerstroemia speciosa and momordica also provide support for balanced glucose levels, further promoting healthy appetite control. I have tried many different diets, only to gain back the weight. 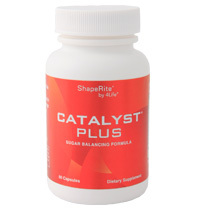 I decided to try Shapefast Ultra along with Catalyst Plus. I noticed a difference in my appetite in just a matter of a couple of days. I feel like I have more energy during the day. I’m very pleased with these products and highly recommend them.